In 2010, TIMA was awarded one of the first two Creative Communities = Economic Development (CCED) grants from the Maine Arts Commission. 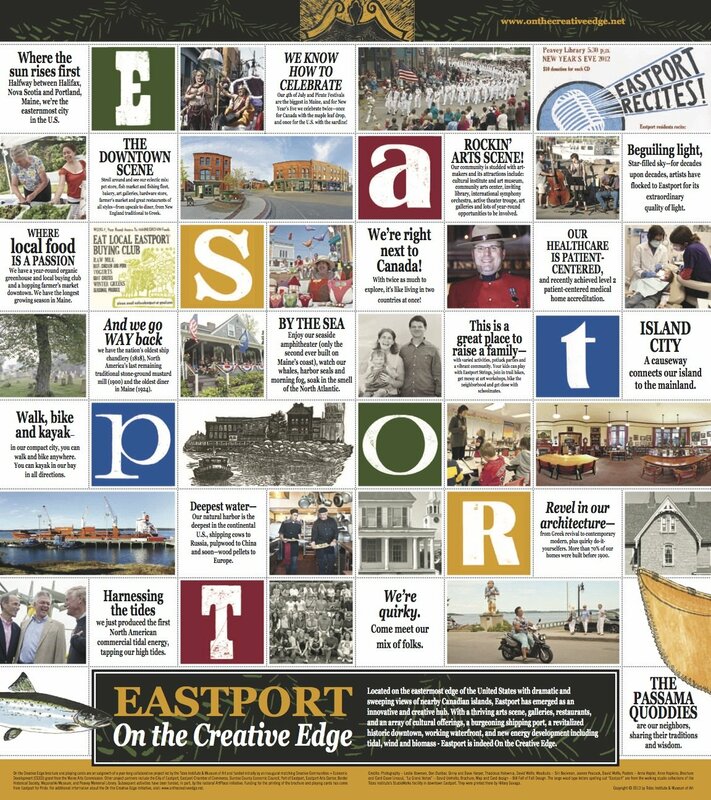 Working with a number of local partners, this TIMA led project included a branding initiative called Eastport: On the Creative Edge. A combined poster, brochure and playing cards were developed around the On the Creative Edge theme to demonstrate how the creative economy involves all sectors of the Eastport and broader community. The marketing firm of Arnett Muldrow & Associates was engaged to help develop these materials. Photographers worked to capture images that demonstrate the creative vitality at play throughout Eastport. The poster, brochure and playing cards were completed and published in the summer of 2013. In addition, a series of community and place based letterpress printed posters have been developed that illustrate the On the Creative Edge theme. An original work of art has been commissioned for each of these posters. Full views of the posters produced so far can be seen here: Port of Eastport, Eastport: On the Creative Edge (version 1), Eastport: On the Creative Edge (version 2).